"Treating Adult Substance Abuse Using Family Behavior Therapy is a welcome addition to the evidence-based substance use disorder treatment literature. 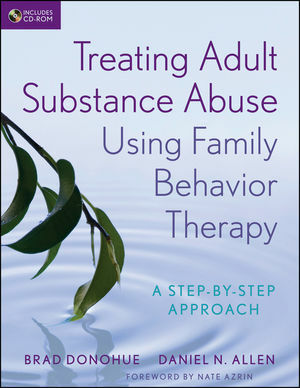 This volume provides a large amount of helpful information, materials, and step-by-step instructions for implementing and troubleshooting family-based behavioral treatment for substance use problems." "I strongly recommend Treating Adult Substance Abuse Using Family Behavior Therapy. Donohue and Allen give readers a step-by-step approach using empirical strategies, client–therapist dialogues, checklists, and handouts that make the therapy process clear and concrete. This book is a must-read for all who want to use FBT in their practice." "I am delighted with the book Treating Adult Substance Abuse Using Family Behavior Therapy. As a relatively new therapist, I used the FBT protocols in a practice setting and the highly structured interventions provided me a sense of confidence while developing professional competence in working with very challenging populations. Although simple in theory, families are empowered by these absolutely positive techniques." With an accompanying CD-ROM containing worksheets, handouts, and other practical materials, this hands-on behavioral approach to therapy equips all mental health professionals with effective strategies to help adult substance abusers and their families through the recovery process. BRAD DONOHUE is a licensed clinical psychologist and Professor in the Department of Psychology at the University of Nevada, Las Vegas. He is the director of the Achievement Center, which is focused on the development of evidence-based protocols for use in disadvantaged populations. DANIEL N. ALLEN is a licensed clinical psychologist and Professor of Psychology at the University of Nevada, Las Vegas. His research focuses on the neuropsychological correlates of mental illness, including substance use disorders and evidence-based interventions for these disorders.